Best Tennis Racquets Under 100 Dollars - That Will Last! Best Tennis Racquet Under $100 - Article Goal: Our goal in this post is to thoroughly analyze, compare and provide the six best tennis racquet options across beginner and intermediate skill levels; all under 100 dollars. If you're not willing to invest $200 or more in a tennis racquet because you're either just starting out or are still a beginner level player, finding an inexpensive racquet that isn't junk can very difficult. That's why we're here to help. We've done over 20 hours of thorough racquet research, consulted with racquet enthusiasts and professionals and read countless user reviews and analyses. 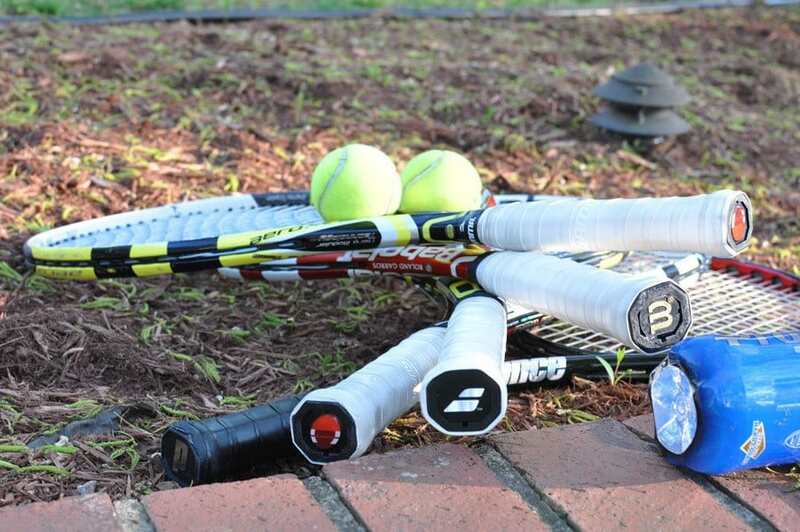 In short we've done our homework because our goal with this article is to give you a complete, concise picture of the Best Tennis Racquets Under 100! Let's get started! 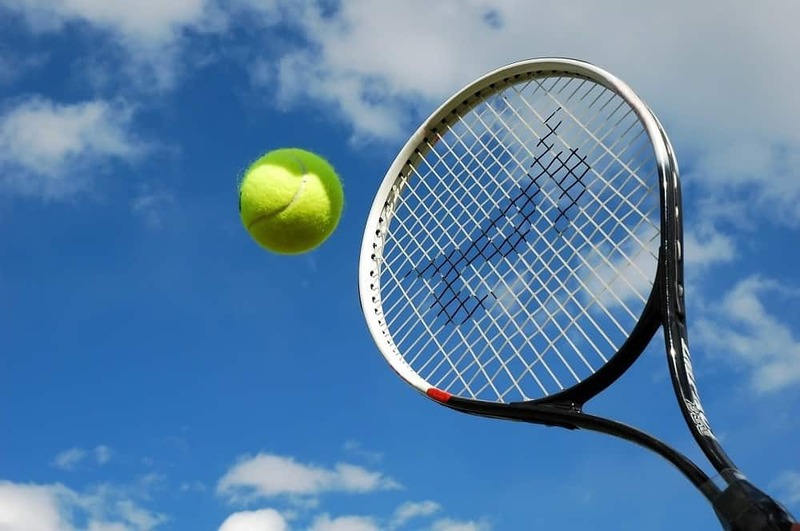 Can play a little "stiff"
If you've been considering getting into tennis but haven't because you thought it was too expensive, then this article will bring you good news. It's true that there are some pretty pricey racquets out on the market these days but if you're a beginner, you can still hit the courts with a quality racquet that won't break the bank. The key is to find that sweet spot between price and quality. Sure you can run out and buy a racquet for under $50. The problem is that it may not last long and you won’t enjoy playing with it. You can also throw a few hundred bucks at a fancy racquet with all the bells and whistles but at this point, is that really what you need? That’s a lot of money to spend on a piece of equipment that may or may not fit your style of play, especially if you’re still learning the game. Best Tennis Racquets Under 100 Dollars - What is a Beginners Racquet? Before we get too deep into which racquets to consider, let’s take a look at what makes some racquets better than others, especially those that are designed for beginners. If you’ve started looking at racquets then you may have noticed that there are so many options to choose from. Even the same model can have two to three difference versions! The sheer number of brands, head sizes and variations within each product line can be very confusing. This is probably why you are reading this article...you might be looking for help selecting a racquet. Inexpensive yet high quality is like a unicorn - it's that mythical combination we're all looking for. It's actually ok if you feel a little bit overwhelmed. Not all racquets are created equal. Some help to give you more power, while others give you more control. There are different lengths, different sized grips and a number of different shaped heads. If you are a beginner, you most likely don't know whether you need more power or more control yet. If you’re like most folks just starting out, you’re just hoping to hit the ball over the net consistently. The first thing that you want to look for in a beginner's racquet is a large sweet spot. This means that you don't always have to hit the tennis ball in the middle of the strings on your racquet. Many beginner players can become frustrated by not being able to hit the ball squarely. Larger sweet spots allow you to hit the ball outside the center of the racquet and still get a good result. Next, you will want to look for racquets that have an oversized head. The bigger the racquet head, the easier it is to hit that fuzzy little green ball; it’s just that simple. Tennis racquets under $100 should still have many of the same features of higher priced models. Many of the more expensive racquets that are designed for advanced players have smaller heads making it tougher for beginners to make consistent contact. Advanced racquets are customized towards control, not power, making it difficult for newer players. Of course, if you watch professional tennis then you have visions of smashing forehand winners past your opponents. Until you get your tour card however, you will want a racquet with added power. Most beginners take shorter swings and don't generate as much power on their own. This is why you will want to find a racquet that helps you generate power. This is accomplished by having more weight in the head of the racquet along with a stiffer frame. Power is not much good if you can’t control it. Tennis courts might feel big when you are running around on them for an hour chasing the ball but they can feel tiny when you are trying to keep the ball in play. Beginner racquets also have dampening systems that help reduce vibrations. This will give you a better feel for the ball resulting in better overall control of your shots. So you see, you’re not really asking for too much from a beginner’s racquet. We just need one with an oversized head, a large sweet spot, extra power and good control. Here are our choices for the best tennis racquets under 100 Dollars. If you are a true beginner, then there are 4 racquets that are ideal for your level of play. This racquet from Head is our top overall pick. It comes in at number one because it has those four key features that we outlined above (oversized head, large sweet spot, extra power and good control). First off, it has a sweet spot that covers the entire face of the racquet. This is ideal for newer player still learning form and mechanics. Head has engineered the LiquidMetal frame with a material that actually has a liquid atomic structure! It is strategically placed at four locations around the frame which keeps the racquet head from deforming on contact with the ball. This results is that large sweet spot we as beginners all need. The oversized head measures 112 square inches giving you plenty of space to hit the ball with. This racquet features a head heavy frame that helps to boost your power as well. You're not wielding a sledge hammer here but, when you want it to, the ball will pop off the strings! The heavy head along with the unique material placed in the frame can add a whopping 29% increase to your swing power! This is ideal for newcomers who can’t generate enough power on their own. To round out the features and give you the best feel for the game, the LiquidMetal 8 has a dampening system on the strings and in the handle. This helps the racquet reduce vibration by more than 25%. This will give you a comfortable grip and improved feel. By combining all of this into one racquet priced below $100, Head takes first prize for best beginner tennis racquet under 100. Our runner-up on the list is another racquet from Head. The Ti.S6 has a lightweight titanium body with a head heavy frame. This combination really boosts the power for beginners with short to medium swing lengths. Many beginner players refer to this racquet as having a lively frame that really whips towards the ball. The head size is also slightly larger than the LiquidMetal 8, coming in at 115 square inches. This ensures that you will have a larger sweet spot to help you with those occasional “miss hits” where you don’t connect squarely. The string pattern on the Ti.S6 is an open pattern. This helps to add a little bit of control to all that power you will be generating. So if you value power over control then this may be the best tennis racquet for your game, under 100 bucks. The Hyper Hammer racquet from Wilson is our pick for most value for the money. We give it this rating because this racquet will help your game as a beginner and continue with you as your game improves. This means that you can plan to use this racquet for several seasons to come. For the beginning player, the Hyper Hammer offers the things we really love. With a name like hammer, you know you are going to be getting a boost in power. The frame is constructed of Hyper Carbon, which is Wilson’s response to all those titanium racquets on the market today. It also makes the Hyper Hammer a light 10oz. The string pattern is tighter which favors players with longer swings that tend to hit the ball flat. This racquet is also longer than most beginner racquets coming in at an impressive 27.5 inches. The extra length not only gives you a little more court coverage but it also gives you better leverage on your swing. The sweet spot on this racquet is big but the overall head size is a bit smaller than other beginner racquets from Head. At only 110 square inches, the Hyper Hammer gives up a little size in exchange for all that power. This also means that the construction of this racquet is less concerned with control. If you are a player that likes to put a lot of spin on the ball, then you may have difficulty controlling your shots. If you are a beginner that has a powerful swing then you will like playing with the Hyper Hammer even as your game improves. The smaller head will improve your hand-eye coordination so you will develop your own control over time while maintaining or perhaps increasing your power. Now that’s a good value! We love what Wilson had in mind with this racquet! Our budget pick is the Wilson Burn 100. This racquet is made of a Carbon Fiber Graphite material that gives any player a powerful and stable feel. Some players would even say that the Burn 100 is actually a little stiff. Regardless, this Wilson racquet is built for power and will help players with shorter swings. Again this is ideal for less experienced players. The racquet is head heavy with a total weight of 10 ounces. The oversized head features 100 square inches of hitting surface. The sweet spot is generous and forgiving which allows the inexperienced player to take a bigger swing and still get good results. The Burn 100 also offers better control and feel compared to the Wilson Hyper Hammer. Built with a balanced approach in mind, the Burn 100 aims to give beginning players plenty of power with a bit more control. If you’ve been playing tennis for a while and have advanced your play to the intermediate level then here are 2 racquets that are made specifically for you, without that high price tag. The Radical series from Head was the preferred racquet for the legendary Andre Agassi. If you ever had the pleasure of seeing him play you will recall that he had a unique combination of power and control all wrapped up in a tiny package. The MicroGel Radical MidPlus is the latest generation of Andre’s racquet that continues the tradition of power and control. The MidPlus has 98 square inches of hitting surface which offers ample size to hit the ball. It is a longer racquet at 27 inches long and it weighs only 11 ounces. While this may sound like all the beginner racquets we just reviewed, it is, as the name suggests, radically different. The difference lies in the weight balance. As you recall, the beginner racquets are designed to be heavier in the head to help novice players generate more power. The Head Microgel Radical is actually 2 points lighter in the head. This configuration begins to transition towards the handle heavy models of the professional players. The result is significantly improved control and spin capability. This control is made possible by the MicroGel that is part of the frame’s construction. Mixed with carbon fibers, the MicroGel works to allow the racquet to conform to the ball on impact. This allows the racquet to absorb and then distribute the impact of the ball throughout the entire racquet head. The folks at HEAD know what they're doing, you can feel that immediately with this racquet. The result is a smoother swing and precision control which is why the Radical MidPlus is our top pick for intermediate players looking for the best tennis racquet under 100 dollars. The final racquet on our list is from a company that has become synonymous with tennis over the years. Prince has long been one of the most trusted brands in the game, and for good reason. The Lightning 105 is another example of Prince’s commitment to making great racquets, at extremely affordable prices. As its name suggests, this racquet is light, fast and powerful. Made from a Titanium Carbon braid, Prince has fashioned this racquet with its Triple Threat reinforcement system at the 10 o'clock and 2 o'clock locations on the frame's head. This helps to stabilize the racquet while the 105 square inch hitting surface generates extra power for your swing. The oversize head also comes with an oversized sweet spot. When it comes to feel, this racquet is almost perfectly balanced! This gives the intermediate player the optimal combination of power and control. The extra long 27.25-inch frame will help you to extend that feel for greater court coverage. If your game is steadily improving and you ready to combine power with extra spin then the Lightning 105 might just be the perfect storm for under $100. At the end off the day, if you’re looking for the best tennis racquet under 100 dollars, we hope these six options give you a place to start. Remember, just because you’ve found an inexpensive racaquet, doesn’t mean it’s a good one. Quality can be found at lower price points, you just have to know where to look. Whether you’re a beginner or climbing up to intermediate ranks, we’ve given you six budget friendly racquet options that are tested and proven in the tennis community. Give one of them a test drive and buy the one that fits your style of play the best. Then you can take all that money you saved and get yourself some tennis lessons! Have a budget racquet you love that we didn’t mention? Post a comment below, we’d love to hear what you’re playing with! Need help selecting other tennis related gear? Click here.